President Maithripala Sirisena yesterday said that re-export of imported tea and pepper would be stopped from 10 February. 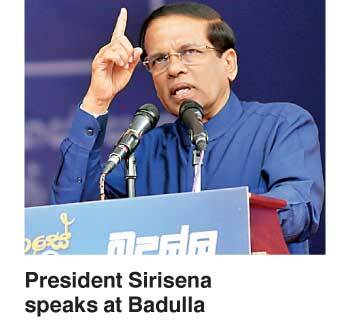 He made this announcement while speaking at a UPFA election rally in Badulla. The President said farmers were losing money and the country’s image was getting tarnished with exporters importing substandard tea and pepper and mixing the same with local produce and re-exporting it. During his speech in Badulla yesterday the President also said that the 100% duty on the import of potato seeds would be removed.